(Nanowerk News) Drum roll please. US scientists have created a one-atom-thick membrane that resonates like a drumskin. 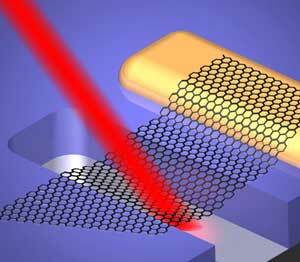 Paul McEuen and co-workers at Cornell University, New York, US, stretched a single sheet of graphene - the hexagonal layer of carbon atoms found in graphite and carbon nanotubes - over a trench etched into a silicon dioxide surface. No sign of a nano-drumstick though: the researchers 'beat' the drum with a voltage or a laser matched to the natural resonant frequency of the graphene sheet. The resonators are ideally suited for mass, force and charge sensing, McEuen reports in Science ("Electromechanical Resonators from Graphene Sheets"). Other researchers have made similar resonators using beams of silicon or diamond hundreds of atoms thick, but this development represents the thinnest possible vibrating layer. The graphene may only be one atom thick, but McEuen is pleased with his drum's performance. 'It's robust and tough, it's wonderful, and it's also very inert,' he told Chemistry World. McEuen appears to be well on the way to forming the world's first nano rock band. His group have previously built a resonator using a single carbon nanotube which vibrated like a guitar string. The graphene drumskin offers more realistic potential than the nanotube version, however, as the wiggling of the 2-D sheet can be observed optically by interferometry, which involves passing a second laser through the grapheme and measuring variations in the intensity of the light reflected back from the silicon base. McEuen also found that the grapheme sheet had a high Young's modulus, a measure of the material's stiffness. Combined with the very low mass of the single sheet, this makes the resonator ideal for highly sensitive mass measurement. Even a single monolayer of gas molecules adsorbed to the sheet's surface could double its mass, and hence the frequency at which it oscillates. For this potential to be realised, McEuen needs a more reliable fabrication technique. The sheets were put in place by rubbing bulk graphene over the substrate like a pencil. 'It's the crudest thing you could imagine,' according to McEuen. The sheet is held in place by van der Waals forces, and some of its vibrational energy is lost. But Armour suggests that if a better way of clamping the graphene to the silicon dioxide could be found then the quality of oscillation could be improved. Crucially, this could allow the frequency, or pitch of the drum, to be tuned.